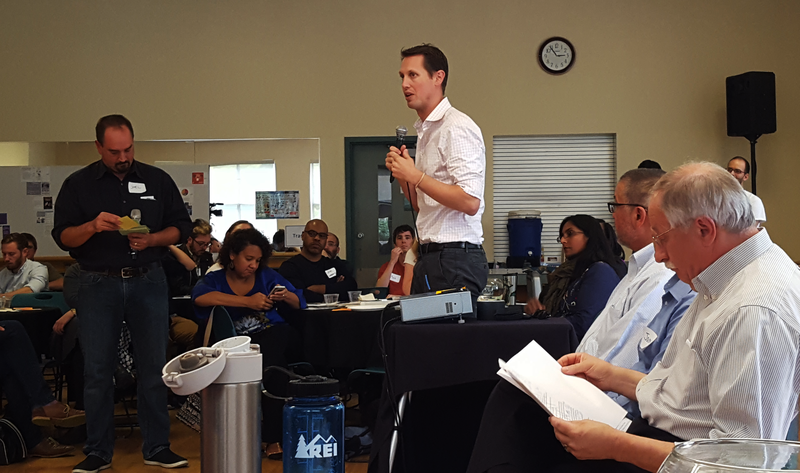 On Saturday the Capitol Hill EcoDistrict hosted a Renter Summit to kick off a community conversation about rising rents, renter protections, and transportation options. The half-day event at Miller Community Center drew at least 100 residents from the Capitol Hill, First Hill, and Central District neighborhoods and was headlined by a variety of prominent officials, including Seattle Mayor Ed Murray and Councilmember Kshama Sawant. The goal of the event was for residents to understand the latest data on housing and transportation, share information with each other, and begin to develop priorities for local and state advocacy. An estimated 80 percent of Capitol Hill residents are renters, but they are rarely represented in community discussions and policy decisions. Not a single City Council member is a renter. Citywide, renter’s voices were left out of last year’s debate about easing zoning restrictions in single family areas to allow more duplexes, triplexes, and townhomes. Changes are afoot, however. Homeowner’s skewed participation in local politics was cited by the Department of Neighborhood as a reason to end official ties with district councils. And for the past two years the city has been working to implement a number of renter-focused policies from its Housing Affordability and Livability Agenda (HALA). Mayor Murray’s opening remarks said Seattle needs to keep moving forward on the city’s homelessness crisis. He has experienced sharp criticism from all sides: property owners and businesses want homeless residents swept up and cleaned out, and advocates say the city isn’t working fast enough to build new housing and streamline social services. Murray cited progress on recent and ongoing legislation with protections for renters and workers, but noted the planned $15 per hour minimum wage doesn’t help the fact that $26 per hour is needed to afford the average apartment in Seattle. However, he lauded the city’s voters for passing new funding for Metro bus service in 2014 and the housing levy in August. Former Councilmember Nick Licata, author of a new book on citizen activism, laid out the basic steps for political organizing: first, identify problems and share information. Then go beyond complaining and come up with solutions for the issue, in order of priority. Standing next to Murray, Licata pitched a new Renter’s Commission to be created alongside the city’s 50-plus boards and committees. During a later panel discussion Councilmembers Rob Johnson and Kshama Sawant supported the idea. Sara Maxana, previously a planner at the Puget Sound Regional Council, noted that Seattle has grown relatively fast in the last five years. But housing construction has not kept up. From 2010 to 2015, Seattle has seen an average growth rate of 40 people and 35 new jobs per day. But the city has only had a net increase of 12 units per day. Landlords are exploiting the situation and raising rents because newcomers have few choices and are competing for scarce housing opportunities. 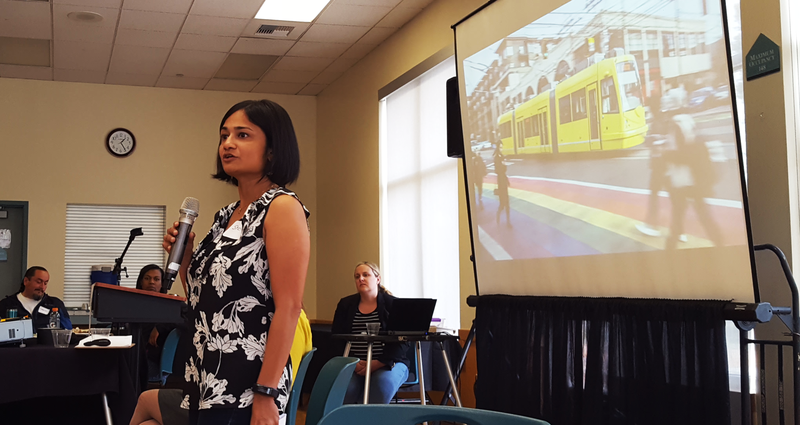 Shefali Ranganathan, Executive Director of Transportation Choices Coalition, noted that Capitol Hill has a rich variety of mobility options. She said 60 percent of the neighborhood’s trips are by foot, bike, transit, carpooling, or ride-sharing. The need for owning a car, which she said costs up to $9,000 per year, is on the decline. She also focused on the impact of parking on housing costs, and cited research showing structured parking increases rents even for tenants who don’t use a parking space. She pitched more efficient use of city streets, like bike lanes, bus lanes, and paid parking, declaring “Free parking is not a God-given right” to a round of applause. Later in the day the participants broke into discussion groups led by facilitators. Fellow renters shared their stories and thoughts on how they live and travel in the neighborhood. The table I led focused on displacement due to rent increases and redevelopment of older buildings. Many residents have been forced to room with other people or accept substandard units because their rent payments are increasing faster than their incomes. There was also concern with hate crimes in the LGBTQ community, especially in the nightlife corridors on Broadway and Pike/Pine. But people remain attracted to Capitol Hill and surrounding neighborhoods because it’s easy to get around without a car, and amenities like parks and shopping are close to home. The end goal of the discussions was to develop key questions on affordability and mobility. These were fed to a panel of local officials: Councilmembers Johnson and Sawant, State Senator Jamie Pedersen, House Speaker Frank Chopp, and Metro Deputy Manager Victor Obeso. Highlights of the discussion included a pointed question for Chopp, who defended his stance on a housing tax break which would apply to existing properties that reserve 25 percent of units for low-income renters. Chopp pressured the sponsoring legislators to kill the bill in March, citing his opposition to subsidizing private corporations. Obeso responded to a question about spending on bus fare enforcement. He said that each RapidRide line costs $350,000 per year to staff with fare enforcers, and passengers appreciated the improved sense of security. Johnson stepped in to to say low-income fare evaders should be given free ORCA cards, not fines, which elicited loud approval from the audience. The full list of questions is posted here, and the panel agreed to later respond to questions which couldn’t be asked at the event. At the conclusion, Capitol Hill Housing’s senior planner Alex Brennan asked attendees to fill out “commitment cards” to be ambassadors for their buildings and to stay involved. The hope is that renters will build their power through networking, spreading awareness of renter issues, encouraging their neighbors to register to vote, and attending City Council meetings to testify on important policies. Beyond Capitol Hill, renters also make up a majority of Seattle residents (52 percent), translating to a sizeable political force if it can be mobilized. If you want to get involved, the Capitol Hill Renter Initiative has a mailing list, can be found on Facebook, and typically meets monthly at 12th Avenue Arts (1620 12th Ave). This entry was posted in Housing, Policy, Public Participation, Transportation and tagged affordability, Capitol Hill, City Council, EcoDistrict, Frank Chopp, HALA, housing, increases, Jamie Pedersen, Kshama Sawant, living, mobility, policy, rent, Renter Summit, renters, Rob Johnson, Sara Maxana, Seattle, Shefali Ranganathan, transportation, transportation choices, Victor Obeso. Bookmark the permalink.